The Incredible Hulk, aka Bruce Banner. For probably the first time, Bruce has willingly triggered a transformation, hoping that he can, if not control the beast, then at least “guide” it to the right target. Played by Edward Norton, but mostly CGI. The Abomination, aka Emil Blonsky. (Note that this is the character’s comic book name, not something he’s addressed as here. There’s only a cute reference to the word when Dr. Sterns says it as a warning of what Blonsky could become.) The combination of Blonsky’s repeated treatments with an unstable super-soldier serum and a dose of Banner’s gamma-radiated blood have transformed him into an enormous monstrosity. He’s roughly Hulk-sized if not bigger, but more reptilian, with scaly skin and spiky bone protrusions. Unlike the Hulk he seemingly retains more of his intellect, as evidenced by his fluent speech, but between Blonsky’s previously deteriorated mental state and anything else the transformation might have done to him, the Abomination is wildly aggressive and hungers for destruction. Played by, again, Tim Roth and CGI. The Setup: Once again the military has managed to track Banner, but this time they actually get him– probably because they quietly sniped him with a tranquilizer rather than charging at him with a small army in full view. They get him just after he’s hooked up with his digital pen pal “Mr. Blue,” aka Dr. Samuel Sterns (teased to become the comic villain “The Leader,” if Marvel Studios ever gets around to it), who gets some samples of Banner’s blood and manages to suppress a transformation. Before they can determine whether the process was permanent or not, Bruce gets taken out and the Army storms the lab. Later, an unhinged Blonsky coerces Sterns into applying the Hulk formula to him, and the results are… ugly. As in, “scaly Goomba Hulk without pants” ugly. Before you can say “challenge accepted,” Banner convinces Ross to release him into the urban war zone– send a monster to stop a monster. Relying on an adrenaline charge to trigger the transformation, Bruce has them drop him from very high. He apparently Hulks out at the last moment, emerging from a crater as his jolly green self. 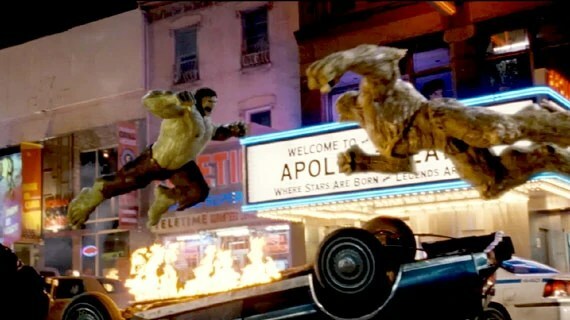 The Fight: There’s a nice moment of quiet after Hulk’s crash landing, as the two eye each other. Hulk roars, and Abomination charges over gleefully. The two fling themselves at each other in a glorious slow-motion shot. Abomination gets the better of the collision, tackling Hulk to the ground and immediately using his momentum to fling Hulk several dozen feet away. 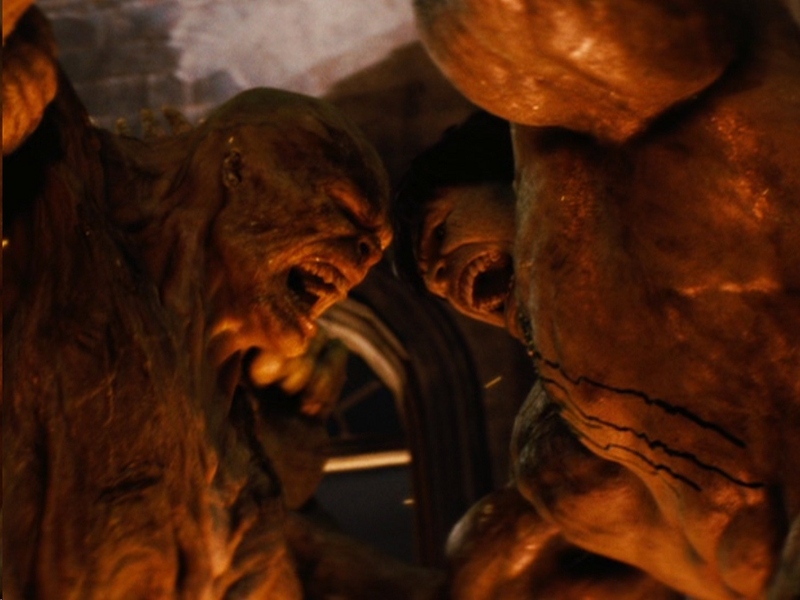 With the reach-advantage the car-gloves give Hulk, he’s able to get the first strike on his abominable foe, and beats him down quite thoroughly, until the car parts are all ground away and Blonsky is embedded in the pavement. However, the monster reveals his resilience with a callback to his line from the previous confrontation, taunting Hulk with “is that all you got?” Before Hulk can respond with a finishing blow, Abomination kicks him hard enough to launch him into the air and through a neighboring building. Sadly, the best parts of the fight are now all over. Abomination’s search for Hulk soon changes into him avoiding heavy automatic fire from Ross’ helicopter (which, incidentally, keeps getting way too close to its target for comfort). The two titans tangle again when hero just barely prevents villain from tackling the helicopter (which also has Betty in it, because of course it does) right out of the sky. With Abomination dangling from the landing gear and Hulk dangling from Abomination’s leg, the chopper has to make a crash landing on a rooftop, trapping all inside and knocking everyone who isn’t a main character unconscious. The combatants clash again at the crash site, with Abomination pinning Hulk against a nearby wall through sheer brute force. Telling him “you don’t deserve this power,” he stabs Hulk’s pectoral with one of his shoulder spikes and invites him to watch Betty die. Opting not to, Hulk once again draws strength from the sight of Betty in distress, and slowly breaks free, then smashes Abomination’s head into the wall. He takes a moment to quell the fire spreading around the helicopter with the force of a super-powered clap (cool! ), which gives Blonsky enough time to rise behind him and grab a chain attached to… something. I’m not really clear on what this very long, very heavy chain with a heavy weight on one end is doing atop this random Harlem building, but okay. Abomination blindsides Hulk and puts him down with a couple swings from his chain. The villain begins to swing it again in preparation to bring it down on the chopper, asking the general if he has any last words. Hulk replies in Ross’ stead, bellowing his iconic “HULK SMASH!” for the first time on the big screen. Curiously, what he actually smashes is the rooftop in front of him. The point of impact creates a wide crack that snakes over to where Abomination’s standing, trapping his foot inside. Thrown off-balance, the monster loses control of his weapon, which falls right back down on his ugly mug. Hulk wastes no time grabbing the chain and choking his opponent with it, fending off all his scrambling attempts to fight back. Truly bloodthirsty, he seems quite ready to hold on until Blonsky stops breathing, but Betty cries for him to stop. With Abomination subdued, Hulk has a quiet moment with his love and says her name, before fleeing again to leave Ross to clean up the mess so he can go do more sad-music-accompanied hitchhiking. This is a lot of fun, but its biggest sin is that 90% of the fighting happens in one brief, furious spurt right at the beginning; from there it’s an uninspired chase scene that we know will come to nothing (come on, a whole battalion AND a gunship couldn’t take down Hulk in the last battle, what’s a lone helicopter going to do to Abomination now?) and some back & forth between the two on the rooftop. That brief bout of fighting, however, is everything a titanic superhero fight should be. There’s suitable dramatic buildup to the confrontation, and the CGI is not just empty special effects; it’s obviously not real but there’s some genuine weight to it, and the combatants move in ways both believable yet fantastically impressive; you can almost feel the power behind each punch. Also welcome is how you can generally keep track of the action– a more significant accomplishment than it sounds considering it’s a night-time battle between two fast-moving CGI monsters of similar size & shape. And the Abomination, with motion-capture work apparently done by Roth himself, makes for a fantastic villain. The fight’s ultimate solution is yet another example of a time when we find ourselves in a bind because it’s laudably clever/unexpected yet somewhat disappointing; you don’t usually expect a Hulk fight to end with him tripping his enemy and then choking him out from behind. Still, hearing Hulk say his trademark line (said by Lou Ferrigno, in a gratuitous but sweet bit of fan-service) goes a long way, and there is some cold brutality to go along with Hulk’s smart thinking. Not to mention the delights of the oh-so-comic-booky elements like the car gloves, the sonic clap and the aimable mini-earthquake. As with before, the movie’s heart being in the right place helps smooth over its imperfections. That aforementioned dramatic buildup is something to be applauded– the movie has the courage to put some real action gravitas behind what is frankly a very boilerplate and predictable confrontation. It was very refreshing at the time for a big-budget superhero movie to be so straightforward and have the Hulk square off against what’s basically another, more evil Hulk… and not, say, a goofy absorbing weirdo who turns into a giant electric cloud. Coming Attractions: An even more dangerous man named Bruce. Don’t make him Bruce Lee. You wouldn’t like him when he’s Bruce Lee. 2008’s The Incredible Hulk is underrated. It’s not great by any means, being underwhelming in certain aspects and lacking in others. But its heart is in the right place, and more importantly, it helped continue the groundwork its same-summer companion Iron Man had just recently begun. Again, this sort of thing is taken for granted in Marvel movies now, but all throughout the film you can feel a solid sense of respect & affection for the source material, an understanding that these people get the property, and want to have fun with it. Certainly it can be credited with swerving the franchise sharply away from the dour, pretentious Ang Lee version. The director of the reboot, Louis Laterrier, is generally known as a genre schlockmeister, but in addition to all the competent action Laterrier actually pulls off some very striking shots and a few other nice tricks. Unfortunately, while the movie fulfills its action quota, only two of its action beats could be reasonably qualified as “fights.” The first real Hulk-out, in a bottling plant after a tense chase through Brazilian favelas, is excellent but over too quickly and takes place mostly in the shadows; in one of the film’s smarter moves, it’s seen mostly from the perspectives of Hulk’s tormentors, and plays out more like a horror sequence. But there’s still plenty of fun left to be had. The Incredible Hulk, aka Bruce Banner. In case you haven’t heard, Banner is a mild-mannered scientist who, thanks to a lab accident involving gamma radiation, turns into a nigh-unstoppable rage beast whenever he becomes too angry or afraid. (This movie seems to tie the transformations directly to his heart rate reaching a certain threshold, a rather bland interpretation.) The Hulk is enormous, incredibly strong, durable, and can leap tall buildings in a single bound. He’s also typically seen as “dumb” in contrast to the brilliant Banner, but this varies with each adaptation and even more so throughout the comic’s history; some Hulks are child-like idiots, some have a normal intellect, and some have just flat-out been Bruce Banner in a big green body. More recent work has even claimed that all incarnations of the Hulk retain Banner’s genius on some level, allowing the creature to intuitively calculate his seemingly random destruction so as not to harm innocent bystanders. Also important: not only does rage trigger the Hulk’s transformation, increased anger will amplify his power. “The madder Hulk gets, the stronger Hulk gets.” Played by Edward Norton, who acquits himself well as a brooding & thoughtful man of action, and also apparently did extensive but uncredited re-writes of the script. A small element of the United States Army, maybe a few dozen. They’re mostly equipped with small arms, but have several Humvees, a few of which are mounted with .50 caliber machine guns, and two more have some other interesting tech. Additionally, there’s a helicopter gunship nearby. (They’re also all wearing the woodland-camouflage Battle Dress Uniform, which the Army had fully phased out before 2008, the year this was released– let alone by 2011, the year this apparently takes place. Oops.) The troops are led by Thaddeus “Thunderbolt” Ross, a general deeply involved with the DoD’s gamma radiation/”special weapons” department, who has been obsessively hunting the Hulk for years and is also the father of Banner’s ex-girlfriend, Betty (awwwwwwkward). Played by William Hurt. Emil Blonsky, Ross’ point man in this endeavor. A British Royal Marine “on loan” to Ross for the Hulk chase, Blonsky is a cold-blooded special forces veteran. As the lone non-casualty of the bottling plant encounter, Blonsky has a bone to pick with Hulk, and Ross has worked to enable this rematch by pumping Blonsky full of an unthawed attempt at a re-creation of the super-soldier serum– the same one that made Captain America. Played by GFS hall-of-famer Tim Roth. The Setup: Ross, as usual, is chasing Bruce Banner. This time around he’s pinpointed the fugitive’s location to the sprawling university campus where Betty works, after he’d re-surfaced there seeking assistance. Uncle Sam wants Banner alive, so they can figure out from his body how to re-create the Hulk, so as before they’re going after the guy with non-lethal means. After the hero bolts, Betty tracks down her father and implores him to stop. She is less than successful, and gets detained on the sidelines. Though Banner’s inside, Blonsky and the majority of the troops remain out front, knowing that’s where they’ll need to be if they can’t subdue him before a transformation. In a neat practical effect, Blonsky is shown very easily out-running the rest of the infantry behind him– a cool way to introduce the effects his “treatments” are having. Banner leads them on a merry chase across the campus, stopping at one point to swallow a thumb drive containing important data. Gross, but a necessary move for a guy whose pockets are about to get jacked up. Eventually, Banner finds himself trapped in a nifty glass walkway separating two buildings. Soldiers lock the doors on either side, and on Ross’ orders they fire knockout gas into his confined space. He starts to succumb, but when he looks outside and sees Betty distressed, his eyes turn green…. The Fight: At Ross’ order, all the soldiers start to unload on him, mostly with M16s. It’s little more than an annoyance to Hulk’s thick skin, and deters him not at all as he charges forward. A few Hummers with mounted .50 cals show up and begin firing, but even good old Ma Deuce can only cause Hulk moderate pain. Before they can even try to do worse, Hulk knocks over the nearest Humvee to him, then picks up another and smashes it repeatedly into a nearby sculpture, then the ground. Not one to let a nice piece of wreckage go to waste, the beast rips out part of the vehicle’s engine block and hurls at at a third Humvee, hard enough to knock that one into another Humvee. They both explode, which is always welcome. This leaves Blonsky to take on the Hulk directly. Armed with a grenade launcher, he starts closing in on the Hulk, firing at intervals the whole way. The first couple rounds catch Hulk before he can react and do knock him back a bit, but soon he’s able to display some battlefield improvisation, and seizes two huge chunks of the metal lawn sculpture and uses them as shields. Isn’t the guy with the super soldier serum supposed to be using a shield? 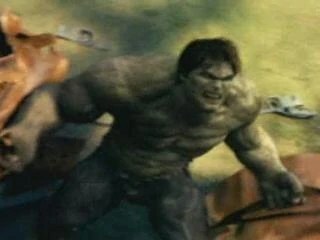 After he gets in close enough, Blonksy drops the weapon, though it’s not clear if it’s because he ran out of ammo or if he lost his grip when he has to leap forward to avoid Hulk’s first counter-swing. Either way, Emil is reduced to just using his sidearm from here, which obviously doesn’t faze the big green guy at all. But his acrobatic dodging is quite incredibly, leaping and flipping all around Hulk’s would-be swings. Ross, impressed, orders Blonsky to draw the target into the next phase of the plan: the sonic cannons. 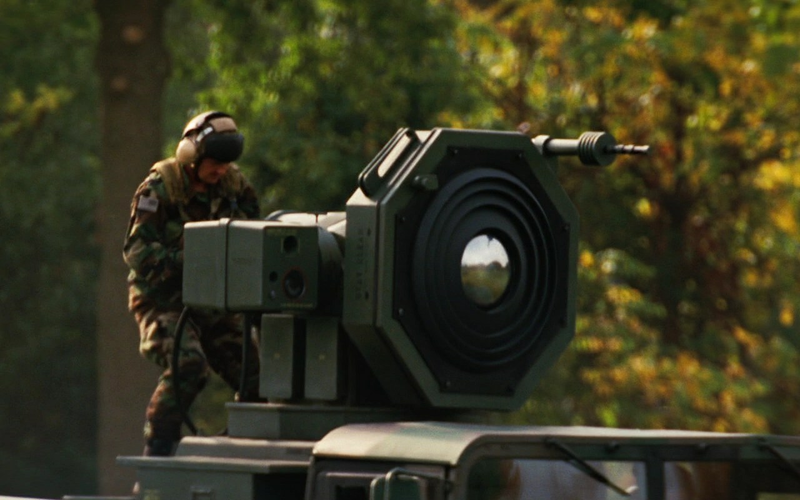 These new weapons (apparently made by Stark Industries, of course) are non-lethal devices which fire visible waves of “sound” into the air and somehow incapacitate the target. It’s not clear if they do so merely by causing overwhelming pain to the target’s hearing/inner ear, or if they have their own concussive force, as is implied when Blonksy gets grazed by one just as he’s jumping out the way, which sends him tumbling too. But either way, you have to love these things: they’re SUCH a deliciously comic book-y contrivance, symbolic of how much fun this movie’s willing to have. The cannons, once they’re both trained on Hulk, actually fix him pretty well at first, bringing him to the ground in pain. But once again, Hulk draws his strength at the sight of Betty’s visible distress over him, and forces himself back to his feet. Mitigating the sonic waves somewhat by first putting the metal shields in their path, and then he throws one right down the middle of the vehicle it’s mounted on, blowing it up. With the damage output reduced by half, Hulk is free enough to leap right onto the other cannon, destroying it personally. Nearly out of options, Ross calls in the nearby gunship. Overly confident and disregarding orders to stand down, Blonsky takes a few more rifle shots at Hulk. 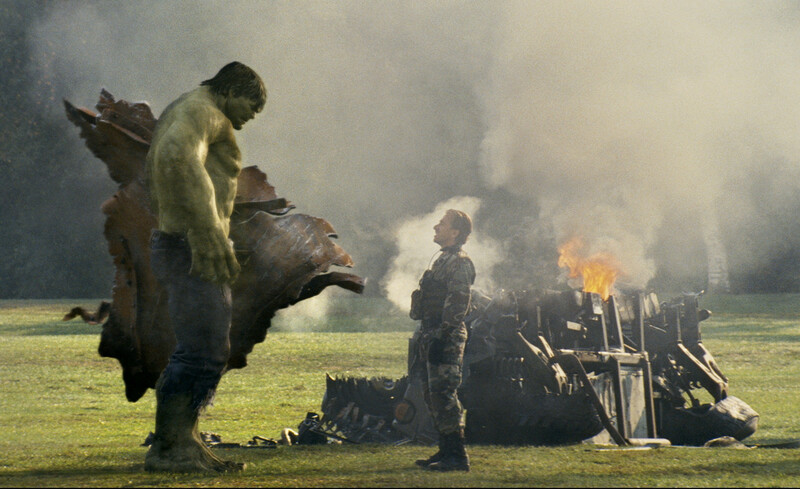 When he’s out of ammo, he confronts Hulk face-to-face, daring him to continue their wildly disproportionate duel. “Is that all you got?” he taunts. Disgusted, Hulk casually but swiftly boots Blonsky right in the chest, propelling into a tree about a hundred feet ahead. It looks like it hurts. Betty tries to get close to the Hulk to make him calm down, which her dad somehow fails to notice before the gunship closes in. He tells them to not fire but it’s too late, leaving Hulk to use his body to protect her from the hail of powerful ammunition. The entire patch of grass they’re standing on is reduced to a smoking pit by the strafing helicopter, but Hulk survived it. Cradling an unconscious Betty, he leaps away to safety. Mark this one as another loss in the government’s War on Hulk. This is good, if not great, stuff for the superhero genre. It’s a tight and confined to one location, but still fairly epic in its small-scale way; the 2003 Hulk disaster had another, bigger confrontation with the military which eventually wore out its welcome. Hulk goes up against not just conventional Army might but also some wonky sci-fi weaponry and a deranged, British version of Captain America (not to be confused with the other British version of Captain America), which adds to the fun. And throughout there’s nice beats like the Hulk’s improvised shields, proving the creature’s tactical intelligence. We even some nice character moments: right after the Hulk transforms, Ross mutters to himself, “now she’ll see,” thinking that Betty will lose her affection for Bruce now that she personally witnesses how much of a monster the Hulk is. But ultimately it’s the Hulk who bravely rescues Betty from Ross’ own monstrous bad decisions.